I write this blog in English because my intended audience speaks that language. While I am honored to have many Salvadoran readers, my intended audience are those English-speakers outside of El Salvador who have some connection to the country. through travel, or marriage, or a sister church, or a Habitat for Humanity project. I try to be one source, hopefully trustworthy, of information about Salvadoran current events. But a blog entry can't possibly convey the full reality. That requires being there. That requires encountering El Salvador in its people. El Salvador Throws Out Gang Truce and Officials Who Put It in Place -- the New York Times reports on the actions of El Salvador's attorney general to prosecute government officials involved with the 2012-2014 gang truce and reports that prosecutors have their sights set on David Munguia Payes, former Minister of Public Security and current Minister of Defense. The gangs that cost 16% of GDP -- a report from the Economist which describes in detail how gang extortion imposes a tax on all segments of El Salvador's economy. Deadly gang extortion rackets drive emigration from El Salvador - Reuters also looked at extortion and its role as a cause of migration. The city government of San Salvador under the direction of its mayor Nayib Bukele has been recovering the public spaces in the city's historic center, and doing so without violence, protests or force. In an area of more than 20 city blocks, the informal street vendors have removed their stalls to other locations, freeing up the streets and sidewalks around cultural and historic buildings and plazas. In recent decades, the city's historic center near the National Palace, the Metropolitan Cathedral, the National Theater and other important buildings has been the swarming center of the informal economy. Thousands of informal vendors have set up make shift stalls where they hawk everything from mangoes to make-up, from pirated DVDs to piñatas. The stalls are built on the sidewalks and into the streets, blocking access and obstructing the view of historic architecture. Traffic congestion in the area is extreme at all hours of the day. If you are on Twitter, make sure and follow HistoriadeElSalvador (@ESHistoria32) for a steady stream of historic photographic images from El Salvador like the one below. El Salvador is now ranked fifth in the world with respect to the quality of its access to information laws. The rankings are produced by a program of Access Info Europe (AIE) and the Centre for Law and Democracy (CLD). The strength of El Salvador's ranking is a product of the country's Law of Access to Public Information adopted in 2011. Politicians in El Salvador need to be more aware that every cell phone is a potential video and audio recorder. In March, a video surfaced of gang leaders meeting with ARENA politicians to talk about how the gangs could support ARENA in the 2014 presidential election. This week another recording has been disclosed in which an FMLN government minister meets with the gangs around the same time talking about how the gangs could assist the leftist party get a victory for Salvador Sanchez Ceren in 2014. Meanwhile, new attorney general Douglas Meléndez is arresting and prosecuting for "illicit associations" some who worked in the government and took steps which facilitated the 2012 gang truce. For too many years, the words "violence" and El Salvador have been inextricably linked. Two recent publications offer different, but complementary, looks at violence in this Central American country. Neither one offers a solution, but both help provide a deeper understanding that might someday help lead towards solutions. The homicide rate in El Salvador dropped more than 40% from March to April this year, and yesterday the government issued orders to arrest more than 20 people involved with the 2012 "tregua" or gang truce which produced a similar homicide reduction of more than 50%. 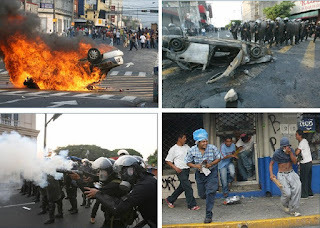 The confluence of these two events is emblematic of the confusing state of public security policy in El Salvador.